Hello Friends! Steve and I took a little trip last Thursday to Maryland to do some antiquing. On the way we stopped at Lucketts Store which is one of my favorite shops. Miss Mustard Seed sells some of her wonderful creations at Lucketts. Friday morning we woke up to snow but that didn’t stop us from heading to Chartreuse & Co. for their once a month barn sale. Before heading home we stopped at a couple of antique malls in downtown Frederick. It was a fun couple of days and it was nice to get away together. I bought a few things on this trip that I will be posting at a later time. I did want to show you a pillow I bought at Chartreuse. Isn’t she lovely? You can see more pictures of our bedroom and sitting room here. I also have a long overdue thank you to Lindy @ Cottage Hill for these fabulous stockings I won in her giveaway last month. The crown is actually a tree topper that I bought at an after Christmas sale for 80% off! I also wanted to say thanks to Rachael @ Lovely Crafty Home who both passed the Stylish Blogger award on to me. I will be back later to list the seven things you may not know about me and to pass the award on. Thank you for stopping by and I enjoy reading all your comments. What a gorgeous bed! 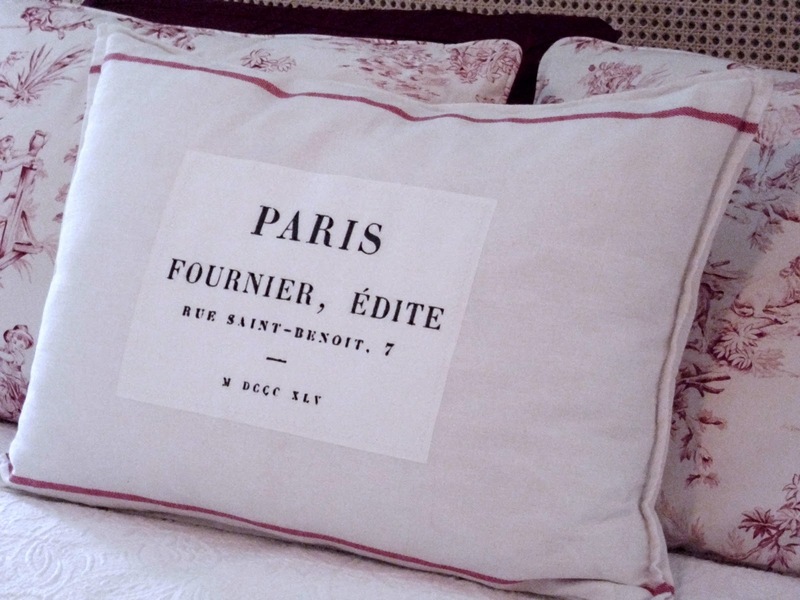 Your new pillow is the perfect accessory for your lovely french room! I was so very distracted by your beautiful winged headboard that, at first, I did not notice the pillow! LOL! Perfection! First off how lucky are you to have a husband that will go antiquing with you. My husband has stopped at a couple of places for me to look around, but he hates to shop. Love that pillow and love your bed. Great pillow, Sherry! I love how the red line in the fabric works with the other red you have. Beautiful stockings you won, too! Such a beautiful pillow and it looks outstanding on your bed. This shopping trip sounds like a ton of FUN!!!!! Sherry, I'm so glad you and your husband had a nice weekend away, and I love that pillow!!! It looks perfect in your beautiful bedroom! 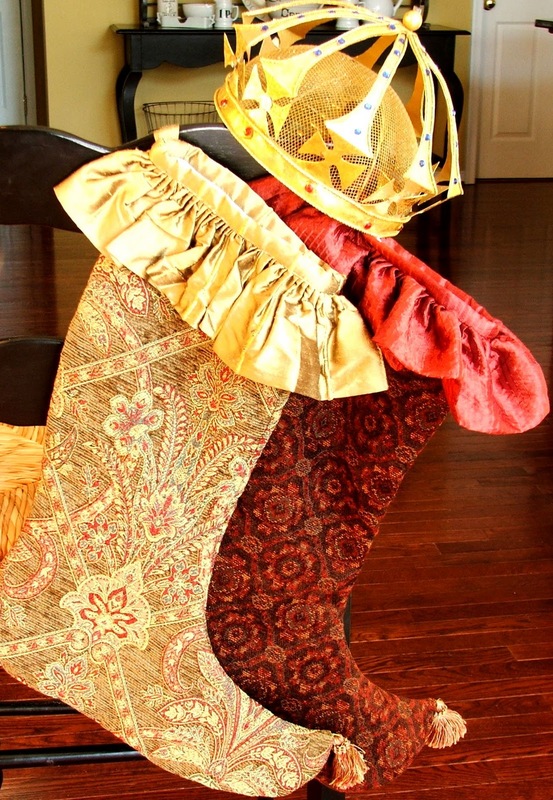 And those stockings are really pretty! I love toile, but every time I've thought about using it for my bedding, I feared I'd grow tired of the pattern quickly. However, I love it in your room. Looks like you found a great find with the pillow. Looks like your be having a beautiful mantel with those stockings next Christmas too! Pillow is wonderful. Wish I had one just like it! Love that pillow, and it looks so good on your bed. Love your bedroom too! Love, love, love this pillow, but your bedroom is absolutely gorgeous. The touches of red in the bedding is just perfect. LOVE your new pillow! So lovely with your toile! Love that pillow! It looks just perfect in your lovely room. I was at Chartreuse last Friday morning too! I would have loved to chat with you! I love your pillow. Your whole room is so pretty! Happy Friday. I love your new pillow! It looks so pretty in your gorgeous bedroom. I love that pillow!!! I love how it goes so perfectly in that room! Ooh, looks like Luckett's has a sale next weekend. Thanks for the info! WooHoo! 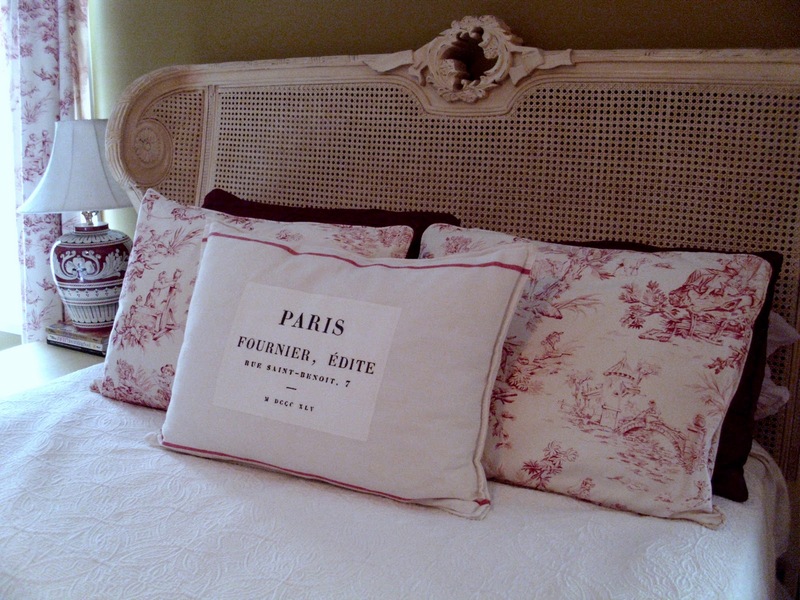 I love that pillow…actually anything French! I'm going to look at some other photos of your pretty bedroom! Oh, I do like to visit here…that cushion is to die for! I went for a little tour of your bedroom…everything is so beautiful…you sure know how to decorate! Sherry, your bedroom is exquisite and your new pillow is the frosting on the top. Can't wait to see what else you purchased on your Maryland adventure. Years ago my friend lived in Frederick and I visited many times, would love to go back to the area now that I know where to shop via your blog. Oh Sherry I love it! I love anything Paris, what a fun trip you had! Love that gorgeous bed! Happy Pink Saturday! G'day Sherry ~ Elegance & warmth … so inviting. Love your bedroom. I wrote you an email … you can't be too far from me. Sherry, would you share the brand name of your white dining room chairs? I was just looking at the post from September about your dining room and love the chairs. Everything is just lovely. That pillow really finishes off the bed. Your bedroom is just stunning and just what I would expect to find in a Parsian Inn…I haven't been but it just looks like it. Thank you for sharing….I LOVE THE PILLOW AND BEDDING AND THE PLATES ON THE WALL. I can see we will be friends! Love your taste and eye..and all these wondeful pictures. What a great blog (and loooove your name) lol. Love that headboard on the bed, so pretty! I am new to blogging and loving it…..started my own about 3 weeks ago about the bulding of our new home and my passion for decor and design..please stop by! What a great couple of days to spend together! You certainly have an eye for design – I truly love your bedroom and can I say I LOVE that pillow!! Can't wait to see what else you bought! Beautiful and classic rich red..so french! Your pillow is incredibly charming! Actually your whole bedroom is so beautiful! PS: Drop by my blog to see its new look! Tell me if you like it, ok? i just joined your blog and took a tour of your tasteful home. i love the cane headboard and looking for one just like it, do you have any suggestions? 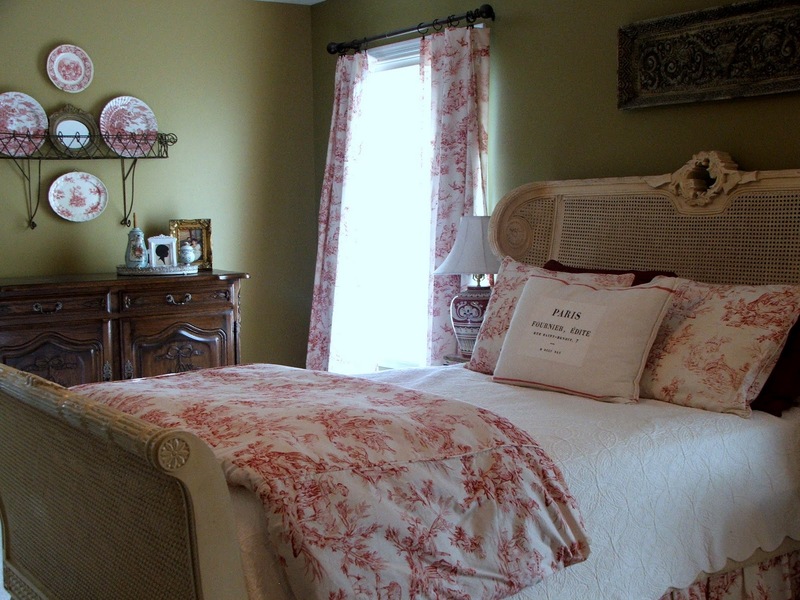 Sherry I just saw your master bedroom,It is gorgeous I love the fabric and that bed is to die for. Thanks for sharing.